"Co-operative Wholesale Society" redirects here. For general information on organisations of this name, see Co-operative wholesale society. The Co-operative Group, commonly known as the Co-op, is a British consumer co-operative with a diverse family of retail businesses including food retail; electrical retail; financial services; insurance services; legal services and funeralcare, with in excess of 4,500 locations. It is the largest consumer co-operative in the UK and owned by more than 4.5 million active members. Members are democratically involved in setting business strategy, decide how social goals are achieved, and share in its profits. Membership is open to everyone aged 16 and over, provided they share the values and principles upon which the group was founded. The Co-operative Group has over 70,000 employees across the UK. 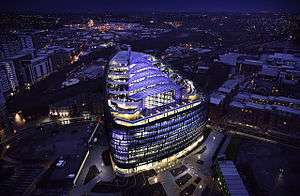 The group has headquarters in Manchester on a listed eight-building estate which includes its head office One Angel Square, the CIS Tower, Hanover Building, New Century House and Redfern Building. The Group also manages The Co-operative Federal Trading Services, formerly the Co-operative Retail Trading Group (CRTG), which sources and promotes goods for food stores of the co-operative movements of the UK. It introduced The Co-operative brand in 2007, which is used by many consumers' co-operatives in the UK and managed by the group. It replaced this for its own businesses with a revitalised version of its late 1960s "Co-op" logo in 2016. The business has long established itself as an ethical retailer, and was the first major UK retailer to champion Fairtrade. The Co-operative Group has also pioneered a number of other initiatives, including providing nutritional information on its own brand food, producing environmentally friendly household products and has won awards for raising animal welfare standards. It has invested significantly in community projects and renewable energy generation. It has held the Fair Tax Mark since 2015. The Co-operative Group has developed over 165 years from the merger of co-operative wholesale societies and many independent retail societies; evolving from solely a wholesale operation to a major retailer. The Group's roots are traced back to the Rochdale Society of Equitable Pioneers, established in 1844. The Rochdale Society of Equitable Pioneers was based on the Rochdale Principles - which notably introduced the idea of distributing a share of profits according to purchases through a scheme which became to be known as "the divi". Although The Co-operative Group incorporates the original Rochdale Society, the business' core for much of its history were its wholesale operations. This began in 1863 when the North of England Co-operative Wholesale Industrial and Provident Society Limited was launched in Manchester by 300 individual co-operatives in Yorkshire and Lancashire. By 1872, it was known as the 'Co-operative Wholesale Society' (CWS) and it was wholly owned by the co-operatives which traded with it. The CWS grew rapidly and supplied produce to co-operative stores across England, though many co-ops only sourced around a third of their produce through the CWS. It was this continued and fierce competition with other non-co-operative wholesalers which led to the CWS becoming highly innovative. By 1890 the CWS had established significant branches in Leeds, Blackburn, Bristol, Nottingham and Huddersfield alongside a number of factories which produced biscuits (Manchester), Boots (Leicester), Soap (Durham) and textiles (Batley). In an attempt to drive down the significant cost of transportation for produce the CWS even began its own shipping line which initially sailed from Goole docks to parts of continental Europe. One of the CWS' steamships, the Pioneer, was the first commercial vessel to use the Manchester Ship Canal. This rapid expansion continued so that by the outbreak of World War One the CWS had major offices in the United States, Denmark, Australia and a tea plantation in India. The head offices for The Co-operative Bank and the CIS in Manchester's 'co-op quarter'. There was a great deal of consideration on the role of the CWS in the British co-operative movement around the turn of the twentieth century. Many, fiercely local, societies saw the CWS as a valuable supplier but did not want to exclusively purchase produce from them owing to perceptions of high cost (mostly transport costs) and unreliable quality - some things the CWS were at pains to resolve. In contrast to this, the CWS had its aim to be the centrepoint for the whole co-operative movement in the UK and lobbied hard for loyalty from co-ops. To this end, they started to assist the local retail societies in more ways than simply as a wholesaler. The CWS Bank, the precursor to The Co-operative Bank, financed loans for societies to use for expansion through purchasing new buildings, land or new equipment. After the acquisition of the Co-operative Insurance Society in 1913, the CWS also provided insurance services to members and the CWS also began providing legal services - all businesses which form parts of The Co-operative Group today. It was hoped that these financial ties, as well as the CWS corporate dividend, would increase loyalty to the CWS. During the Second World War rationing led to an effective pause in any major changes to the co-operative movement in the UK with the CWS becoming highly involved in sourcing overseas goods for UK consumers and manufacturing wartime goods. During this time the CWS began planning for the future, as even then they could see the potential disruption to the retail market that the new multiple grocers could have. In 1944 the CWS published a report entitled Policy and Programme for Post War Development which focused on methods for revitalising the co-op movement after the war had ended. The report suggested merging the CWS with the Scottish Co-operative Wholesale Society (SCWS); reducing the number of co-operative societies through merger; moving into the manufacturing and production of white goods and the expansion of The Co-operative Bank. This report received much criticism from the fiercely local co-operative societies and the proposals of the report were only partly and slowly implemented. There was some attempt to modernise the co-operative stores around this time. After the London Co-operative Society opened its first self-service shop in 1942, the co-operative movement led the way on the development of self-service stores to the point where, by the 1950s, 90% of self-service shops in the UK were run by co-operatives. Despite this the market share and the number of members of the society began to dwindle and – importantly – so did the member share capital which societies used to invest. The Co-operative Independent Commission (1958) was tasked with investigating the decline in the co-op movement and for making recommendations for revitalising the movement in the future. Its recommendations had two main thrusts: that a strong response to the emerging multiple-store supermarket chains (including the appointment of professional managers) was needed and that the Co-op needed to come to terms with the rise in consumerism and to move away from its association with the 'working poor' rather than a more prosperous working class. This was not to say that the Co-op had not been modernising, notably through opening self-service stores and supermarkets. However, the report suggested that the Co-op needed to become more responsive to the grocery market by being more competitive on price, by rationalising on unprofitable stores and by recruiting professional managers. The CWS responded with operation facelift in 1968 which introduced the first national co-operative branding, the 'Co-op' cloverleaf. Though Operation Facelift led to some improvements, the movement (including the CWS) remained largely unreformed with its grocery marketshare continuing a downward trend. Again, it was suggested that societies merge to form regional societies to improve their competitiveness through enhanced economies of scale. Many local co-op societies strongly resisted such mergers but, as their financial situation declined, many were forced to merge to create regional societies or were absorbed into either the CRS or the SCWS to avoid failing. Consolidation within the movement was considerable, and in 1973 serious financial mismanagement of the SCWS Bank led to the SCWS and the CWS merging to form a single UK-wide wholesale society. 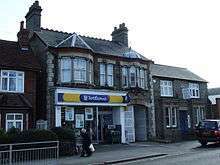 The merger did highlight the potential of The Co-operative Bank as it was building a sizeable base of customers (notably local authorities, mutuals and local groups alongside co-operative societies) and this became an increasingly significant proportion of the CWS's annual profits. The growth in the bank largely related to its aggressive expansion into the personal banking market and with the pioneering of free banking (1972) in the UK, nine years before any of its larger rivals. 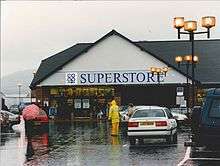 The Co-op superstore Lisburn Road, Belfast, shown here in 1996. The co-operative movement's marketshare and profitability continued to decline during the 1970s and 1980s, in part, due to a number of reasons. Firstly, the process of de-industrialisation, that had characterised the period led to serious economic difficulties in many of the movements heartlands (notably the northern industrial towns), which disproportionally impacted on the societies through a decrease in consumer spending despite the British economy seeing a rise in overall consumer disposable income. This was largely due to the strong increase in inequality in the UK at this time. The co-operative movement was not well placed to tap into this increase in middle class spending due to the geographic spread of its stores and The Co-op's historic association as the shop for the 'working poor'. Secondly, redevelopment projects in many cities between the 1950s and 1970s often moved people from rows of terraced housing (which featured co-op stores dotted throughout) to newer purpose-built estates, with around 18,000 co-op stores closing as they had become redundant. Thirdly, the time was a period of notable inflation and a strong pound, which had led to a wave of cheap imported goods – this devastated much of the UK's manufacturing industries (including the CWS). By the 1980s, it became clear that the trend in the retail sector was towards large (often out of town) supermarkets and hypermarkets with hundreds of them appearing across the UK. The co-operative movement did build some superstores, having 74 by 1986, but often their development and competitiveness was hindered by the lack of a national distribution network and price competitiveness. In an attempt to improve the collective buying power of the movement the CWS acted to reposition itself from a wholesaler (from which societies can choose to buy) to a 'buying group' (where the CWS buys on behalf of), in order that CWS could increase the proportion of produce sold through co-operative stores that was sourced by itself. Though this did work to increase loyalty, it was not until the 2000s with the development of the Co-operative Retail Trading Group that the CWS became the de facto wholesaler for co-operative stores. During the 1980s the CWS began to merge with a number of failing co-operative societies, having returned to direct retailing after its merger with the SCWS the decade before. These mergers with consumers' co-operatives led to the co-op having both corporate (co-op societies) and individual members, hence making it both a primary and secondary co-operative. The CWS's expansion into direct retailing (especially after the mergers of the 2000s) led to the CWS becoming a highly visible business in the UK. The legacy of this was that many people perceive the British co-operative movement to be one business, The Co-operative Group. By the start of the 1990s, the co-operative movement's share of the UK grocery market had declined to the point where the entire business model was in question. This was at a time when many building societies were demutualising as many of the public preferred the short term financial gain of the windfall payment over the perceived lack of benefits from the mutual model. For a time it seemed as though the mutual or co-op model was almost dead. The Co-op's reputation was not helped in this respect by the factions within the movement, notably the strong rivalry between the CRS and the CWS, acting in a manner which exacerbated the belief held by many members of the public that, rather than working for the interests of all members, co-ops were largely acting in the self-interests of a dominant 'clique' of members within each society. Together these crises meant that the 1990s would become a crucial decade if the Co-op was to survive. In order to raise capital to invest in its food stores (and also the increasingly successful Co-operative Bank), the CWS sold many of its factories to Andrew Regan in 1994 for £111 million in what initially appeared to be a highly beneficial arrangement for the CWS. However, later it appeared that those involved in this deal did so without the CWS Board's permission and had been also handing confidential CWS files to Mr Regan. Notably, one Sunday newspaper printed the CWS' annual report before it had been officially released. This would later pose a huge threat to the CWS when in 1997 Mr Regan posed a highly ambitious £1.2bn hostile takeover attempt of the CWS. This shocked many in the movement and consolidated support for the CWS as the 'linchpin' of the movement in a way that many had previous opposed. The CWS, under the leadership of Graham Melmoth, was able to defend itself from this takeover bid, largely by informing Mr Regan's creditors that his hostile takeover was based upon dubiously sourced data and bad business practices. The deal also failed because Mr Regan had greatly misunderstood the CWS' complicated ownership structure, assuming that by paying off the 500,000 'active members' he could gain control of the CWS. Though this strategy worked for the carpetbaggers working to demutualise UK building societies at the time, it failed to recognise that the ownership actually lay with millions of ordinary members and that many of these 'active members' were staunch co-operators and who would be unlikely to back the bid. After investigations by a private detective and a subsequent criminal court case, Regan's bid was rejected and two senior CWS executives were dismissed and imprisoned for fraud. An arrest warrant was issued for Andrew Regan in 1999 however he had already emigrated to Monaco. The shock that Mr Regan's bid sent through the co-operative movement has been attributed with sowing the seeds for the reduced hostilities between the CWS and CRS factions which eventually ended with the CRS becoming a member of the CRTG before fully merging with the CWS in 1999. The merger took two years to complete and the launch of the newly combined business, named The Co-operative Group, was timed with the release of the 2001 Co-operative Commission report, chaired by John Monks, which proposed a strategy of modernisation. The report focused on improving store design and building a consistent branding whilst also driving for efficiency savings to make the food business more competitive - the similarity in conclusions between the 1919, 1958 and 2001 reports highlights the distinct lack of progress within the movement during this time. The 2001 report also highlighted the need to market what it called 'The Co-operative Advantage'; a favourite idea of Graham Melmoth, which suggested that commercial success would provide the funding for the social goals of the movement which (when the public saw a tangible benefit to their own lives) would provide a competitive advantage to the Co-op which would further its commercial success - a virtuous cycle. Unlike Gaitskell Commission's 1958 report the recommendations of the report, notably the major update to "The Co-operative brand" and the re-launch of the membership dividend scheme, were largely adopted by the co-operative movement including The Co-operative Group. These changes to the business are largely credited with the successes in profitability and the achievement in social goals which improved in the years after the Co-operative Commission report. As a part of the CWS-CRS merger, new governance arrangements were designed with the 'independent societies' becoming part owners of the new Group and their representatives were elected to the group's national board. The largest change, however was the much stronger representation for the individual members of the retailing operation with a string of regional boards and area committees designed to facilitate a clear democracy and representation on a local and national level. The composite nature of the Co-op as both a primary and a secondary co-operative led to the business having both individual members and corporate members (independent co-operative societies) which had to be included in any democratic structure. This led to a governance arrangement which was complicated and not understood by many individual members and which led to relatively few members becoming democratically engaged with the business. During 2007 the then chief executive Martin Beaumont was critical of the lack of commercial expertise on the board, foreshadowing the conclusions drawn from later Myners review into the near failure of the business during 2013 which was (in part) due to an unfit governance arrangement. In 2014 the governance arrangements were completely redesigned to reflect the recommendations of the Myners review - for more information see the governance section. Though the modernisation of the business was most noticeable after the 1997 takeover attempt, this is not to say that modernisation of the CWS had not been under way for some time. Since 1993 the CRTG had been working to switch the role of the CWS from "selling to" to "buying for" co-operative societies as a way of maximising the economies of scale to become more competitive to the major supermarkets. Since the 1960s the Co-op had been following retail trends after they had occurred, always having to catch up, in a way that it led the changes before the Second World War. Many leaders within the movement began to appreciate that this 'me too' approach to retailing was not working, for example expanding into hypermarkets after Tesco and Sainsburys had already developed a dominant position, but without the resources to compete on price. After the 1997 strategic review the business suggested that it close the majority of its hypermarkets and department stores and instead focus on its core chain of convenience stores. As a further attempt to differentiate itself from its larger competitors The Co-operative Bank had introduced an ethical policy in 1992 and this, along with its technical innovation, was well received with customers. The CWS decided that, though it had always aimed to trade responsibly (for example though the working conditions in its factories and plantations as well as its boycott of South African produce during the years of Apartheid), by cementing its "ethical" credentials in a series of strong and clear policy commitments it could work to convince the public of the "co-operative difference". This move posed a bold step for the CWS leadership as this was a wholly new approach for such a large business. As a part of this, the Co-op worked with The Fairtrade Foundation to help introduce the Fairtrade Mark in the UK. It was an early adopter of the RSPCA's 'Freedom Foods' animal welfare certification. It introduced the first supermarket range of 'environmentally friendly' household products and the first range of toiletries certified by Cruelty Free International as "not tested on animals". This new adoption of an ethical strategy was only part of the CWS' changes. The Co-op had been pioneering on notable changes to its packaging with nutritional labelling on food (1985) and later introduced Braille on its packaging. Many own brand products were also reformulated to reduce the amount of salt, sugar and fat in order to make the product range more healthy. So successful was this initiative that competitors such as Sainsburys and Marks and Spencer began to follow aggressively on these initiatives. Example of the 'Co-Op Welcome' branding from Stansted Mountfitchet. 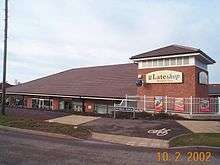 Example of the 'Late Shop' branding on the co-op store in Whitnash. In an attempt to build upon the success which was being felt around the increasing public perception of the co-op as an ethical retailer and to implement what was a core recommendation of the 2001 Co-operatives Commission, The Co-operative Group launched a brand panel which was tasked with developing a single consistent national branding standard for the movement. For decades, marketing by co-operatives was confusing for many customers with different societies adopting different store names (notably "Co-op Welcome" and "Co-op Late Shop"), various shop fascia designs and inconsistent marketing. Also the cloverleaf design of the Co-op logo was seen by many as too associated with the years of neglect and decline within the movement and hence The Co-operative Group aimed to launch a totally new brand. The new "The Co-operative" branding was first displayed at the 2005 co-operative congress and became the first brand which could bring together all of the co-operative businesses (both those of The Group and the independent societies) under a single consistent brand. With the brand came a set of standards which any outlet using the brand must adhere to – to maintain a high standard of impression with customers. A twelve-month pilot of the new branding followed and these suggested that a significant growth in sales followed the re-branding of stores, largely understood to result from a major impact on public perceptions. Not all of the independent societies joined this new branding however, with United Co-operatives (prior to its merger with the Co-operative Group), the Scottish Midland Co-operative Society and the Lincolnshire Co-operative Society not adopting the new brand design. In combination with the new "The Co-operative" redesign, the Co-op sought to relaunch the co-operative membership scheme using a single consistent national standard and featuring the re-introduction of the member dividend. Together, this renewed focus on responsible trading, the redesign of "The Co-operative" brand and the reintroduction of the member dividend helped to build the start of a renewed relationship with the British public. In 2006 a survey found the Co-op to be the most trusted major retailer in the UK and almost six million people joined the membership scheme over the following five years. Even after The Co-operative Group's financial crisis of 2013 the 'Have Your Say' survey found that more than 70% of the public agreed that the Co-op 'tries to do the right thing'. The VG logo and shop livery, c. 1990. Following the integration of the CRS and CWS into the new Group structure it became evident that the business required significant modernisation and rationalisation of its businesses. The Co-operative Group followed by selling its loss-making footwear and milk processing businesses as well as some aspects of its agricultural production. The business also sold many of its larger supermarkets and hypermarkets using the funds to expand further into the convenience store sector, notably through adding 600 stores, following the acquisition of the Alldays chain. Alldays had previously purchased the VG chain of small supermarkets, which operated a franchise operation, supplying marketing and own-brand products to independently owned grocers. The Co-op's distribution facilities were significantly invested in, notably by opening a purpose built National Distribution Centre in Coventry during 2006. As a result of their steady expansion after 2000 the Pharmacy and Funeralcare businesses were performing well, however the farming business was poorly aligned with the needs of the food stores and so was significantly reorganised in 2007 to focus the farmland on producing produce for the businesses food stores. The co-op also moved into new business opportunities during this period adding a legal services business (providing conveyancing, will writing and probate services) and an Energy Generation business, the latter included significant investment in renewable energy generation which formed another key aspect of the co-op's drive towards its ethical image. This period was successful for the co-op in increasing its profitability and in beginning to rationalise what had been a sprawling but rather unsuccessful conglomerate. Many however, believed that for the co-op to survive in the long term it would need to merge with other large co-operative societies. At the start of 2007, the group began discussions with United Co-operatives, then the UK's second-largest co-operative, about a merger of the societies. Such a merger was expected to lead to significant efficiency savings owing to the large duplication of services which the two societies provided. On 16 February 2007, the boards announced they were to merge subject to members' approval, and on 28 July 2007 the newly enlarged Co-operative Group was launched. At the same time, the group transferred the engagements of the Scottish Nith Valley Co-operative Society which, while trading profitably, was suffering a burden with its pension fund commitments. Before the United merger was complete, the Chief Executive, Peter Marks, was already preparing another significant acquisition as he believed that only though significant growth could the co-operative become truly sustainable in the long term. In July 2008, the group announced a deal to purchase the Somerfield chain of 900 supermarkets and convenience stores. The sale was completed on 2 March 2009, costing £1.57 bn. Also in 2008, the group bought ten convenience stores trading as Bell's and Jackson's in the north and east of England from Sainsbury's. In autumn 2008, Lothian, Borders & Angus Co-operative Society members voted to transfer engagements to the Co-operative Group. The transfer came into effect on 13 December 2008. The group announced in November 2008 that despite the economic downturn, half year profits had risen by 35.6 percent to £292.6 million for the six months to June 2008. In January 2009, Co-operative Financial Services and the Britannia Building Society announced their intention to merge, subject to regulatory and member approval. Members of the Plymouth & South West Co-operative Society joined the Co-operative Group in September 2009. The Group's reputation suffered in 2007 when 38 of its 41 stores in Sussex failed fire safety inspections and it was fined £250,000. It was fined £210,000 in 2010 after an investigation at one of its Southampton stores. CIS Tower and One Angel Square in Manchester. In May 2010, the Co-operative Group unveiled plans to build a new headquarters in Manchester. The initial phase of construction commenced on Miller Street near the existing estate where the Group has been based since 1863. The project, entitled NOMA, aims to reflect ethical values of the organisation in its design, construction and its relationship with employees and the surrounding communities. The centrepiece of the initial development is One Angel Square, one of the largest buildings in Europe to have a BREEAM Outstanding Distinction as a result of its high sustainable energy credentials. Occupation of the new building began in early 2013. In May 2013, after recognising inadequate capital levels in its banking group, Euan Sutherland took over from Peter Marks as Chief Executive. That month Moody's downgraded the bank's credit rating by six notches to junk status (Ba3) and the bank's Chief Executive, Barry Tootell, resigned. The difficulties stem largely from the commercial loans of the Britannia Building Society, acquired in the 2009 merger. The Co-operative Insurance sold its life insurance and pensions business to Royal London releasing about £200m in capital, and planned to dispose of its general insurance business. Further financial restructuring was expected. On 5 June 2013, Richard Pennycook, former Finance Director of Morrisons, was named The Co-operative Group's Finance Director, and Richard Pym, former Chief Executive of Alliance & Leicester, as Chair of The Co-operative Banking Group and The Co-operative Bank. The group lost £2.5 billion in 2013, and debt stood at £1.4 billion at the end of 2013. In May 2014, a special member's meeting agreed to restructure the way members elected the board, largely along the lines suggested in a governance report by Lord Myners. The Myners Review was very critical of the co-operative movement's (and especially the Group's) lack of response to the 1958 commission report and for the failure of the Group's governance since the merger of CWS and CRS in 2000. The review also underlined the requirement to focus on making and retaining annual profits which can be invested in the long-term future of the business and to avoid the risks of over-expansion and 'empire-building' as had nearly destroyed the business in 2013. During 2014, the group sold a series of businesses to reduce debt. The Co-operative Pharmacy was sold for £620 million to the Bestway Group, Co-operative Farms was sold for £249 million to the Wellcome Trust, and Sunwin (the group's cash transportation business) was sold for £41.5 million to Cardtronics. Having scaled back their operations to their core food, funeral, insurance, electrical and legal businesses in the preceding years, the business set out modernising these businesses in order to create a stable and profitable base going forward. In April 2015, The Co-operative Group announced that it had reduced its debt levels by approximately 40% (to £808m) and had made a small profit during 2014, but would not pay a dividend to members until 2018. When The Co-operative Group released its annual report in 2016, it showed that its food business was growing faster than the overall grocery market (by 3.2 percentage points) and that like-for-like sales were up 3.8% in its core convenience estate. This reflected the significant growth in the convenience sector in the UK following a shift in consumer habits towards shopping little and often. The food range in stores was refreshed with a smaller range of items, that were tailored to individual stores, rather than their previous policy of determining product range purely on store size. As their ethical image had largely recovered after their financial crisis, the Co-op also chose to focus attention on differentiating its food business by reducing the price and increasing the quality of products, by increasing the proportion of produce produced in the UK and the roll-out of locally sourced products in small clusters of stores (following a successful trial in Yorkshire). The food business chose to focus on their estate of approximately 2,500 convenience stores, selling over 100 of their larger supermarkets and opening 200 new convenience stores during 2014 and 2015, particularly in London and the South East of England. The business sold 298 of its smallest stores to McColls in 2016 with the aim of providing a more consistent shopping experience by focussing on stores primarily in the 2000-4000 square foot bracket where a greater range of own brand products could be sold. Following years of under-investment the Co-op brought in Mike Bracken, in order to completely re-invent the Society's digital operations. Focus was also given to re-targeting the insurance business as the preferred insurance provider for Co-op members rather than chasing market share. In 2016 the Co-op announced its intentions to replace its "The Co-operative" branding with revitalised "Co-op" branding from the 1960s, following fears that members associated the branding with the failures of the organisation leading up to 2013. As a part of this, the Society's membership was reinvented for employees in August 2016 and for the general public in September 2016 and which would includes a reward of 5% of spend on own brand items being credited to the member and a further 1% being donated to a local cause of their choosing. The introduction of this new schemed with announcements that the co-op will become the first major UK supermarket to switch all of its own brand meat (excluding continental meats like chorizo) to being British sourced from May 2017. 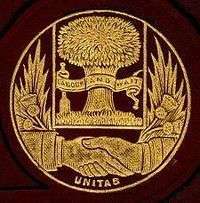 Seal of the Co-operative Wholesale Society. Voting for corporate members is in proportion to trade with the society. Each individual member has one vote in the appropriate region of the society and each region has voting rights calculated on the same basis as a corporate member. Self-help – We help people to help themselves. Self-responsibility – We take responsibility for, and answer to our actions. Democracy – We give our members a say in the way we run our businesses. Equality – No matter how much money a member invests in their share account, they still have one vote. Equity – We carry out our business in a way that is fair and unbiased. Solidarity – We share interests and common purposes with our members and other co-operatives. Caring for Others – We regularly fund charities and local community groups from the profits of our businesses. Concern for Community – Co-operatives also work to improve and develop the community, both locally and internationally. The group has 85% of the co-operative retail business in the UK and substantial shares in wider markets, including travel and funerals. The Group's food retailing business, which trades as Co-op Food, is the largest division of the group with over 2,700 stores of various sizes and with the largest geographical spread of any retailer. The stores are mainly in the convenience and medium-sized supermarket sector, with some larger superstores. The business also acts as a wholesaler for other consumers' co-operatives within the UK through Co-operative Federal Trading Services. The Co-operative Group operates the UK's largest Funeral Director, with over 900 funeral homes, many of which retain their private names whilst most operate using the Co-op Funeralcare brand. In 2015 revenue for the funeral business was £399m. The society owns Co-op Insurance, a general insurance business aimed at providing insurance services to co-op members. It also provides business insurance through a partnership with Miles Smith. Co-op Legal Services is a national legal services provider. Services cover family law and divorce, writing wills, probate, conveyancing, personal injury and employment law. The group announced the formation of this division, based in Bristol, in April 2006. Co-op Electrical sells electrical products, from kitchenware and white goods to home entertainment. In 2015, the Co-op became the first electrical retailer to sell its extended warranty insurance products at cost price. In the previous decades extended warranties had gained a reputation for being poor value for money, but for being heavily promoted by retailers owing to their high profitability. The business is also unusual in providing a 60-minute delivery time slot, confirmed by SMS on the day of delivery. 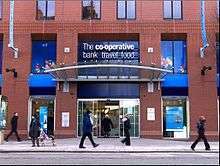 The Co-operative Travel is a joint venture with Thomas Cook and the Central England Co-operative of which The Co-operative Group owns a 30% share. The venture operates 450 travel agencies and constitutes the largest travel agent network in the UK. The merger was referred to the Office of Fair Trading as a result of monopoly concerns. Before the joint venture with Thomas Cook, the branch network was previously branded as either 'Travelcare' or 'Co-op Travel'. The business has direct sales channels through telephone, home workers, and the internet. In July 2009 the business launched its own tour operation as a joint venture with Cosmos Holidays. Currently, the group owns a 20% stake in The Co-operative Bank, which was a wholly owned subsidiary until 2014 when the group was forced to sell the majority of its holding to investors to raise funds for the bank. The Co-operative Bank also includes the internet bank Smile, and the former building society Britannia. The Group has interests in retail site management, property investment and land development which are managed through its business, The Co-operative Estates. The Co-operative Estates is involved in the £800m 20 acre NOMA development in Manchester and operates a large-scale energy buying group for co-operatives. 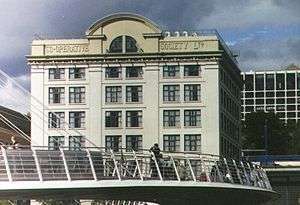 Former CWS warehouse by the Gateshead Millennium Bridge, Newcastle upon Tyne. Syncro was the rebranded engineering and building services business of the Co-operative Group, based in Salford. Syncro was sold in 2006. Associated Co-operative Creameries (ACC) was the group's milk processing and distribution division. ACC handled logistics of the retail business but this responsibility was transferred to Co-operative Supply Chain Logistics before it was sold to Dairy Farmers of Britain, a farmers co-operative, on 10 August 2004. The group withdrew from the department store sector after many years of increasing losses, with several stores being acquired by the Anglia Regional Co-operative Society, and the remainder were closed. Many stores had been in poor locations and had suffered from under-investment. Initially, two stores were to be retained in Perth and Tunbridge Wells to trial a new style of department store, but these were also closed in 2006. The Co-operative Motor Group ceased trading following the disposal of Albert Farnell and its last remaining dealerships in 2013. However, Central England Co-operative continued to operate dealerships as The Co-operative Motor Group until 2015. Shoefayre, established in 1959, as Society Shoes was co-owned by several co-operative societies and became owned and managed by the Co-operative Group. In 2006, it reported operating losses of £6 million and in 2007 was sold to Shoe Zone. The Co-operative Pharmacy, established as National Co-operative Chemists in 1945, grew to be the third largest community pharmacy group in the UK with nearly 800 branches giving a nationwide presence. In 2014 it was sold for £620 million to the Bestway Group. The Co-operative Farms managed land across Great Britain, producing soft fruit, potatoes, flour and cider, and is the largest lowland farmer in the UK. In 2014 it was sold for £249 million to the Wellcome Trust and now trades under its former Farmcare name. The Co-operative Bank head office building at 1 Balloon Street, Manchester. CWS became Co-operative Group (CWS) Limited on merger with CRS in 2001. CWS Retail was formed in 1933 and demerged in 1957 as CRS, with the purpose of opening shops in co-operative deserts and to take over failing retail societies. The combined Group merged with United Co-operatives, based in Yorkshire and North West England, in 2007, reinforcing its position as the largest consumer co-operative in the world. At this time the current name, Co-operative Group Limited, was adopted. Following the mergers of the 90s and 00s, the modern Co-operative Group was formed of a large range of different independent societies with separate brand identities which led to a lack of consistency and gave an incoherent message to consumers. The four-leaf clover "Co-op" brand, introduced in 1967 and adjusted in 1993, was seen by many in the co-operative movement as a hindrance to public perception of the movement. This problem was affecting the whole co-operative sector in the UK and following the report from the Co-operative Commission in 2001, The Co-operative Group was heavily involved with the process of developing a single updated version of The Co-operative brand for use by many consumers' co-operatives in the UK. In 2007, the group began a re-brand of its estate to this new unified identity with its other business names, including Travelcare and Funeralcare, phased out in favour of the new The Co-operative business names. With more than 4,000 stores and branches to convert to the new identity the process has been cited as the "largest rebranding exercise in UK corporate history." The Co-operative Group launched its largest television advertising campaign in 2009. The two and a half minute advertisement aired for the first time during Coronation Street on ITV. The advertisement, created by McCann Erickson, features the Bob Dylan track "Blowin' in the Wind", a rare occasion that he has allowed his music to be used for commercial purposes. The Co-operative Group is unusual as a co-op because it is owned by millions of UK consumers and also a number of other UK co-operatives, making the business a hybrid of a primary consumers' co-operative and a co-operative federation. This is largely a function of the group resulting from the merger between the Co-operative Wholesale Society (a co-operative federation) and the Co-operative Retail Services in 2000. Since 2015 The Co-operative Group has operated a 'one member one vote' system whereby any of the Co-op's millions of members can vote to elect board members, to guide strategic decisions and propose their own motions for voting on. The current governance structure of the business was established in 2014 and comprises an Executive Management Team, a Group Board and a Members Council. The Executive Management Team are the highest level of management in the business and are responsible for its day-to-day operations. The Group Board is a team of between seven and twelve people who are responsible for overseeing the strategy of the business and for holding the executive management team to account. The Group Board is made up of: a Group Chair; either one or two Executive Directors appointed from the Executive Management Team; up to five Independent Non-Executive Directors who are not affiliated with the group; and up to four Member-Nominated Directors. Member Nominated Directors (MNDs) are any people from within the membership group who nominate themselves and have the required level of commercial experience. The Member's Council is a group of up to a hundred people who hold the Group Board to account with regards to the group's purpose, values and principles. Members of the Co-op, its employees and representatives of the 'independent societies' make up the Members Council. Details of those people who are members of the Group Board and the Group Executive are provided here. Details are correct as of 2015. The Annual Report cites a number of factors in determining executive pay, including "attracting, retaining and motivating senior Executives of the appropriate calibre to further the success of the Group" and "ensuring that the interests of Executives are aligned with those of the Group and its members". Former CEO Peter Marks was paid a basic salary of £1,014,000 in 2012, with a performance-related bonus of £103,000. The basic salaries of the thirteen executives adds up to £4,836,000, with their performance related bonuses adding up to £240,000. In March 2014, "private and confidential" documents seen by The Observer newspaper detailed proposals put before The Co-operative's board to double the wage bill for senior management to £12 million a year, whereby the chief executive Euan Sutherland would earn a base salary of £1.5 million and a "retention bonus" of £1.5 million. The Observer also reported that Rebecca Skitt, the Co-op's chief human resources officer, who joined in February 2013, left 12 months later "with a proposed pay-off totalling more than £2m". Between the creation of The Co-operative Group in 2000 and the major governance changes of 2014-2015, the Group had a complex governance arrangement which consisted of the business executive, the Group Board of twenty people, a series of regional boards and numerous area committees. The Group Board was made up of fifteen "lay" member directors elected from regional boards, another five which came from the "independent societies" and, though there was the option to appoint up to three "independent professional non-executive directors" (IPNEDs) to the Group Board at any one time, only one was ever appointed. All Group Board members (excluding IPNEDs) were appointed by competitive regional election – in contrast, most building societies and PLCs have a nominations committee which recommends potential board for election members based on a number of strict criteria. A series of regional boards, consisting of twelve to fifteen people elected from area committees, were responsible for holding the Group Board to account and for block-voting at the Annual General Meeting. There were 48 area committees which were responsible for representing member interests and promoting membership within their constituency. Out of the millions of members that the Group had, only area committee members are able to vote in the elections for the regional boards and "lay" director seats on the Group Board and the votes were weighted depending on the value of sales within individual areas. One of the justifications for this complex governance arrangement was that it took a number of years to reach regional board level, which helped to minimise the influence of single-issue campaigners and carpet-baggers. In the 1990s it was these issues, notably the failed take-over by Andrew Regan in 1997, which caused significant problems for the, then, CRS and CWS. The Myners Review noted that "the primary source of power within the Group [was] firmly entrenched at the level of the Regional Boards" and the review concluded that it was this 'labyrinthine' structure, where Group Board members need to remain elected to Area Committees and regional boards, which led to the governance problems at the Co-op and its financial crisis of 2013. The idea of co-operative trading revolutionised food retailing with the dividend, often known as "divi", and the "divi number" became a part of British life. The way in which co-operative retail societies are run for the benefit, and on behalf of their members sets them apart from their modern-day competitors. The dividend is a financial reward to members based on each member's level of trade with the society. The distribution of profits on the basis of turnover rather than capital invested is a fundamental difference between a co-operative and most private sector enterprises. Historically, members' sales would be recorded in ledgers in society's stores and at the end of the collection period a proportional payment would be made to the member. As the societies grew, and the number of members increased, the method of using ledgers became cumbersome. As a solution, some societies, including Co-operative Retail Services, issued stamps to members for qualifying transactions. Members collected stamps on a savings card and, when the card was complete, would use it as payment for goods or deposit into their share account. By the late 20th century the group's predecessors and then the Co-operative Group no longer paid true dividend as it had become a drain on limited resources, although several independent societies (such as Anglia Regional) continued to do so. In the mid-1990s a loyalty card scheme, in the style of the Tesco Clubcard, was introduced which used the dividend brand. These loyalty cards were inspired by the co-operative dividend but were little more than marketing exercises and a way to gather useful customer information. Co-operative customers, not just members, could sign up and receive a swipe card to record purchases with vouchers sent out twice a year which could be exchanged for cash or goods. In September 2006 the Co-operative Group relaunched "true" dividend whereby a proportion of the profits of the Co-operative Group is returned to members. To emphasise the change, the scheme is now called the Co-operative Membership and members earn a "share of the profits". New members are recruited by allowing them to deduct the refundable subscription for a £1 share from their first dividend. Members can collect points to increase their share of the profits by using the services provided across the whole family of businesses. In 2008, the dividend almost doubled to £38 million, equivalent to 2.63p per point (one point being earned for each £1 food purchase), reflecting an 8% increase in underlying profit. Group membership increased sharply in the first year after the relaunch, to 2.5 million with many more young people who have an affinity with the co-operative values and principles attracted to join. In 2007, the Oxford-based Midcounties Co-operative joined the group's membership scheme allowing its members to earn dividend at Co-operative Group stores and vice versa. Since then, other independent co-operatives have joined the reciprocal membership dividend scheme, including Central England Co-operative (merged from Anglia and Midlands who joined in 2008 and 2010 respectively), Southern Co-operative (2009) and Chelmsford Star Co-operative Society (2009). This reciprocal membership agreement means members of these societies can earn membership points at more than 90% of UK co-operative outlets. The current co-op membership scheme was launched in September 2016 and rewards members with 5% of what they spend on own brand products and services being credited back to their membership account. A further 1% is donated to a local charitable or community cause which the members helps to select. Additionally members will still earn their share of the profits when the member dividend returns (expected 2018). Though the independent societies are not participating in the 5+1% scheme, members can earn the points (from which the profit share is derived) at five of the largest consumer's co-operatives within the UK owing to a reciprocal membership scheme (described above). As the UK's largest co-operative, the group plays a key part in the co-operative movement. In the 1840s the original co-op shops were set up to protect consumers from adulterated food and profiteering shopkeepers. Since then the co-operative movement has campaigned on a number of issues which they thought were key consumer interests. As a part of this, The Co-operative Group has long been campaigning for consumer rights legislation, researching into new food labelling initiatives, a major sponsor of new co-operative ventures, a notable donor to community initiatives, directly involved in the development of animal welfare standards and in championing Fairtrade in the UK. The Co-op has traded on its 'ethical' credentials for many years and in 2014 a survey suggested that 70% of the British public believed that it was a business that 'tried to do the right thing'. The co-op is particularly known for its work in championing the introduction of Fairtrade in the UK, investing in renewable energy and in reducing its carbon emissions, in maintaining high standards of animal welfare, in being a leading retailer of responsible fish, for reinvesting its profits in local communities and for campaigning on a range of social issues. The following section will discuss many of these activities in more detail. The Co-operative is widely recognised for its commitment to responsible and ethical trading, particularly for championing fairtrade in the UK. These commitments and its mutual structure led to The Co-operative Food being awarded Ethical Consumer magazine's 'Best Buy' status in 2011 and 2014. Following significant public outcry regarding the Tax avoidance of many well known multi-national companies the co-op was awarded the Fair Tax Mark in 2015, an independent certification designed to identify businesses which are not aggressively seeking to avoid paying taxes. Each year the business publishes a sustainability report on its website with a breakdown of the key social, environmental and charitable activities which were undertaken during the previous financial year. In 2008 the company was awarded the European Business Award for the Environment (Management category) by the European Union for its commitment to combine competitiveness with respect for the environment. The Co-operative Group was the first major UK retailer to stock Fairtrade products and was the first UK supermarket to sell Fairtrade coffee (1992), bananas (2000), own-brand chocolate (2000), own-brand wine (2001), pineapples (2002), sugar (2005) and blueberries (2010). Since then, all own brand block chocolate (2002), coffee (2003), sugar (2008), bananas (2012), winter blueberries (2012) has been converted to Fairtrade. Co-op Food is also the largest UK retailer of fairly traded wine and has the largest range of Fairtrade products in the UK. In 2014 its Fairtrade sales were £133m. The Co-op's "Beyond Fairtrade" programme is run in addition to paying the standard 'Fairtrade Premium' payment. The programme has included working with many groups of smallholder farmers to establish democratic co-operative businesses to sell their product (to suppliers including the Co-op) and through the Co-op providing investment funding to enable the farming co-operatives who supply them to convert to Fairtrade certification. £475,000 in funding was provided between 2012 and 2014 for this programme. The business has also been involved in developing certification schemes for additional Fairtrade products (in association with the Fairtrade Foundation and Traidcraft) including rubber gloves (2014), coffins (2012) and charcoal (2009). Since 2005, 98% of The Co-op's electricity has been sourced through renewable sources, notably wind power, hydro and anaerobic digestion. This relates to 12.3% of the business's total energy usage being sourced from renewable sources (2014). The business has also been constructing its own renewable energy generation facilities and currently operates three wind farms with a fourth given planning permission in 2014. When the fourth wind farm is complete, it is expected that The Co-operative Group will generate almost 25% of their own electricity consumption. When combined with improvements in its supply chain, notably a reduction in fuel used in its vehicle fleet, and the fitting of doors to its store refrigerators(a measure which reduces their energy consumption by 40%) this has led to a 43% reduction in its carbon emissions since 2006. The Co-op also buys renewable energy from community energy projects including Torrs Hydro and Settle Hydro. In 1994 The Co-operative Group became the first retailer to support the development of the then new RSPCA Freedom Food scheme with the aim of improving welfare standards for animals at all stages of the food chain. Their range of "freedom foods" certified products began from around this time. The Co-op also has a range of animal welfare standards for its own brand chicken, pork and turkey products which are more strict than UK legal requirements. It has also labelled the living conditions of the hens which lay its eggs in the 1990s and became the first retailer to switch to only using free-range eggs in all own brand products. As a result of these policies, The Co-operative was awarded a 'Tier 2' standard by the 'Business Benchmark on Farm Animal Welfare' for 2013. In this report The Co-operative was recognised for banning the prophylactic use of antibiotics or any other artificial substance for use in promoting abnormal animal growth in all own brand products; prophylactic antibiotic use is found in the majority of meat sold in Europe but has been linked to the development of antibiotic resistant infections such as certain strains of E. Coli. The business only allows antibiotics to be administered "with the specific written approval of a vet to address a specific health threat." The business also limits any journey time when transporting of livestock to 6 hours, but most journeys should be under 1 hour. The Co-operative is one of the leading retailers of responsible fish in the UK having launched its Responsible Fish Sourcing Policy in 2008 after commissioning research in association with NGOs, academics and its suppliers. This report was subsequently updated in 2014. The Co-operative Food was commended by the Marine Conservation Society with a "gold award" (2011) and a "silver award" (2013) and, for its sourcing policy, The Co-operative was one of five organisations accredited with the 2010 Seafood Champion Award. Since 2011 all own-brand tuna has been caught using the pole and line method and does not use "Fish Aggregation Devices", a method with a significantly lower by-catch rate when compared with conventional tuna fishing. Since 2012, all farmed salmon has been certified by the RSPCA Freedom Foods accrediation scheme. In 2008 the Co-op committed £200,000 to enable fisheries which would struggle to fund the certification process to become accredited by the Marine Stewardship Council. In 2015 the Co-op became one of the first retailers to join the "Ocean Disclosure Project" which requires the business to report transparently on the geographic locations, fishing methods and sustainability characteristics of all of the fisheries from which they source. This move confirmed an ongoing commitment by The Co-operative Food in promoting transparent and responsible fishing in the UK. Like many co-operatives, The Co-operative Group runs a community dividend scheme where each year a share of the businesses profits are re-invested into the communities where they trade. In 2002 the group gave 5.4 percent of their annual operative profits to communities as their community dividend for the year - a total figure of £10.7m. The Co-operative Group, like most co-operatives, has supported the development of co-operative businesses in many sectors of the economy through its "Enterprise Hub". This has provided financial and business management help to small and start-up co-operatives, notably including F.C. United of Manchester, public service mutuals and a number of community pub ventures. Assisting the development of community renewable energy projects in the UK. In addition to this, the business has provided on targets to reducing its own environmental impact including reducing direct GHG emissions by 50% relative to 2006. As a part of its attempts to highlight the problem of climate change and specific issues relating to fossil fuel extraction, the group campaigned against tar sands oil extraction and fracking. To this end, The Co-operative Group part-funded the UK release of films including Chasing Ice, Gasland and H2Oil to raise awareness of the cause and, as a part of this, local members organised screenings in various communities. In 2011 the Co-op wrote an open letter to the Defra which was signed by 190 large organisations and businesses calling upon the government to introduce mandatory carbon emissions reporting - a measure introduced for "businesses listed on the Main Market of the London Stock Exchange" in 2013. The Toxic Fuels campaign was launched to combat the proposed expansion of the Canadian tar sands and proposals to begin fracking at sites in the UK. In 2008 they joined with the WWF-UK to publish a report which concluded that exploiting the Canadian tar sands to their full potential would be sufficient to bring about what they described as 'runaway climate change'. The Co-operative Bank were also vocal supporters of the Beaver Lake Cree Nation’s legal action against expanding oil extraction in Alberta, raising and donating over C$400,000 to support the BLCN legal case and focusing media attention in the UK - which led to a protest outside the Canadian Embassy in London. Colin Baines, Campaigns Manager at The Co-operative Group described the Beaver Lake Cree Nation legal action as "perhaps the best chance we have to stop tar sands expansion". In 2013, the court ruled in favour of the Beaver Lake Cree on appeal. The Co-op were also involved in a shareholder resolutions at BP and Shell's 2010 AGM over this issue of tar sands extraction. A further report published with the WWF was critical of the prospect of carbon capture and storage (CCS) technology being used to reduce the release of carbon dioxide into the atmosphere to a level comparable to that of other methods of oil extraction. In the report they claimed that it was this belief in CCS that the oil industry were suing to justify their continued investment in the tar sands. the diversion of investment funds away from renewable energy research and development. Another Co-op funded report concluded that the hypothesised emissions benefits from converting from coal to gas (from fracking) had been overstated. As a part of their attempts to increase public awareness of fracking in the UK, the Co-op encouraged members to organise screenings of the film Gasland across the UK. This move received some criticism, notably from The Daily Telegraph due to perceptions of bias in the film Gasland. The Co-operative Group has been a vocal supporter of community-owned renewable projects for a number of years as a way to combat climate change and fuel poverty. In 2012, the Co-op launched its "Community Energy Manifesto" in association with Co-operatives UK which contained research into the possibility for significant growth in the UK's community renewable sector and it provided a number of case studies. The Co-operative Group, notably through The Co-operative Bank and The Co-operative Enterprise Hub, has provided almost £100m in loans and grants to community-run energy efficiency and renewable energy generation co-operatives (including the Baywind Energy Co-operative and Torrs Hydro). In 2014 the Co-op launched its Community Energy Challenge which worked to encourage community energy schemes across the UK by actively supporting the groups for 18 months to raise awareness of community renewables and to create co-operatively and community-owned and schemes of over 500 kW in size that could be replicated across the country. However, since the problems at The Co-operative Bank the funding for new projects has largely been discontinued. In 1984–85 research commissioned by the Co-op showed that consumers had a preference for food labelling schemes which presented the content of fat, sugar and salt within a product as either "high", "medium" or "low". The Co-op implemented this labelling system on own-brand products the same year. Further research in 1993 suggested that many consumers were confused by the nutritional labelling schemes used at the time. Both of these findings were supported by evidence gathered by the Food Standards Agency in 2002 and the Institute for Grocery Distribution proposed a new labelling system based upon the guideline daily amount principle. As a consequence of this research, the Co-op trialled a new greatly extended labelling format which went above the legal requirement for what should be included at the time (energy, protein, carbohydrate, of which sugars, fat, of which saturates, fibre and sodium) by including reference values for "guideline daily amounts", displaying whether each item constitutes "high", "medium" or "low", providing information regarding recommended quantities of fruit and vegetables, using the word "calories" rather than "energy" and for displaying "salt" rather than "sodium". Overall this new design was endorsed by 89% of those customers asked. As a part of this change, the Co-op was also the first to introduce a graphic on the front of all own-brand products which highlighted the key nutritional information. The choice of the word "salt" over "sodium" was made because their research suggested that most consumers did not understand the difference between the two words and hence significantly underestimated the salt content of processed foods. Because of this, the Co-op also called for the government to legislate so that salt rather than sodium should be displayed on the packing of products. In 2013 The Co-operative Group published further research which they had conducted into front-of-pack labelling schemes and have modified their own front-of-pack labelling scheme to combine both the traffic light and guideline daily amount schemes into one simple system. In 2009 the Co-op also introduced a 'green dot' scheme where additional specifically defined nutritional benefits in products (e.g. over 6 g of fibre per 100 g) were included on the front of the pack. Since 2003, the Co-op has been using a similar system to highlight products which count towards one's '5 a day' fruit and veg – also listing the quantity of the product which required to reach the required serving size. Since 1997 the group has not used "per-cent fat free" health claims. The Co-op introduced calorie labelling for alcoholic drinks in 2002 and they also list the caffeine content of products which contain more than 1.6 mg in a single serving. using very small fonts or text colours to make the label difficult to read. Since 1995, the Co-op has clearly labelled the country of origin and percentage content of key ingredients, even when not required to by law. 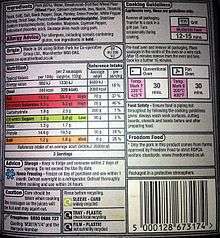 The follow-up report, "The Lie of the Label II" (2002), specifically urged legislative improvements to provide consumers with better nutritional information on all foods (especially those foods which disproportionately contribute to consumers' fat, salt and sugar intake) and a new, clearer, more intuitive format for presenting this information to consumers. The report also warned about the prevalence of advertising for sugary, fatty and/or salty foods which are aimed at children and how this will likely impact on the overall public health of young people the UK. The group has campaigned against many misleading nutritional and 'health' claims which have appeared on food packaging over the years. Those cited included a chocolate spread which is high in both fat and sugar, but which was marketed as "rich in calcium, magnesium and vitamins". Other such claims have included products which are advertised as "low cholesterol" when saturated fat is thought to be a larger control on blood cholesterol than direct cholesterol consumption. The group operates a self-imposed ban on such health claims. In 2003 the European Commission introduced legislation which defined many health claims such as "fat free" and "high fibre" to reduce the prevalence of meaningless claims on food packaging, a move welcomed by the co-op movement. In 2001 the group became the first retailer to include Braille writing on its range of medicines and alcoholic drinks, a move which received three industry awards. In 2015 Braille can also be found on many products, including breakfast cereals. The Co-operative Group became the first retailer to list the ingredients in its own-brand wines on the label in 1999 in a move that was illegal at the time. They justified their move by stating that they "believe it's in the consumer's interest" to know what is in their wine – as many ingredients, including charcoal and fish finings, have been used to give wines distinctive flavours. Ten years later the UK government pushed for labelling of this kind. At the end of April 2012, The Co-operative Group announced that it was "no longer engaging with any supplier of produce known to be sourcing from Israeli settlements." This involved the ending of contracts amounting to around £350,000 with a number of companies sourcing products from settlements built on Palestinian territories, but not Israeli companies in general. The group's pesticide policy bans, restricts and monitors pesticide use at farms which supply its own brand products. The policy aims to minimise the use of chemicals, and the residues which remain on crops, whilst providing safe food but without notably increasing the cost of products. In 2014 39% of tested products from The Co-operative fresh, frozen and canned produce range were pesticide residue free (2011: 35%) whilst 1.4% of tested products had pesticide residues above the Maximum Residue Limit (MRL) set for each product (4.4% is the UK average). Their pesticide policy was launched with a report titled "Green and Pleasant Land" (2000) which formally banned over 20 pesticides which were still in use at the time on human health and environmental concerns and called upon the EU to legislate for a ban, a move which was endorsed by consumer and environmental groups. This move resulted from research that the business, then the CWS, conducted which demonstrated that two thirds of those asked were either concerned or very concerned about the health and environmental effects of pesticides and their residues on foods. The Co-op was the first supermarket to publicise all monitoring pesticide results on the business's website so that members could access the data. The Co-op publish the results of their monthly pesticide monitoring on their website and this indicates that between 2009 and 2015 on average approximately 40% of tested foods had no traces of any of the 449 monitored pesticides and that since 2012 none of the banned pesticides have been observed. When determining which pesticides should be banned the toxicology of each substance, its potential for bioaccumulation and its persistency within the environment are all considered. Those chemicals which are restricted can only be used by growers and suppliers with specific written permission from The Co-operative Group which will only be granted if the grower or supplier has provided supporting evidence that no other alternative is available. In 2013 restricted pesticides were allowed in 123 cases. Research was conducted by The Co-op's farmcare business investigated biological and cultural controls which could be used to reduce the influence of pests and also investigated more benign chemical alternatives to those which were restricted – The Co-op could then suggest viable alternatives to restricted pesticides. For example, trials conducted on their UK farms investigated alternative methods of farm management which could reduce reliance on fungicides and pesticides by 40-50%. Following this, a series of Product Advisory Sheets were created to provide growers and suppliers with solutions for common pests which minimise as previously the most used source of information used by suppliers was that distributed by the agrochemical companies which sell pesticides, a perceived conflict of interest. Lindane was banned from use on crops destined for Co-op own-brand products in 1999 after mounting health concerns, ten years before it was outlawed under the Stockholm Convention on persistent organic pollutants. The Co-operative Food became the first supermarket (2003) to ban a number of toxic chemicals (but which were still legal in the UK) from its own brand range of household products including washing up liquid and fabric conditioners. After recognising the potential for bioaccumulation of the toxic chemicals used in manufacturing and agriculture, the group joined with the WWF-UK on a campaign called DETOX which called for research into new safer chemicals which do no bioaccumulate. The Co-operative became the first UK supermarket to ban the use of neonicotinoid pesticides in any of their own brand products or on their farms in 2009, after Germany, Italy and Slovenia banned the chemicals in 2008 in response to a sharp decline in their country's bee population. The business invested over £300,000 in funding peer-reviewed research on the impact of neonicotinoids on bee populations, campaigned for a ban of neonicotinoids and called on the UK government to support the proposed EU ban in 2013. They suggested that if they, then the UK's largest farmer, had banned neonicotinoids in their products and on their farms four years earlier then it would be possible for the ban to be successfully implemented without significant impact on European farming. As a part of their 'Plan Bee' policy they also funded the UK release of the documentary film Vanishing of the Bees to raise awareness of the issue, gave away 300,000 packets of wildflower seeds to members, offered discounted bee boxes for sale to members and under-used urban areas into colourful community meadows. In 1994 The Co-operative Group began labelling own brands food which contained genetically modified (GM) ingredients and, five years later, they banned the use of GM ingredients in its own-brand products including GM animal feed. Since 2003 the Co-op has banned the growing of GM crops on their own land (at the time they were the largest lowland UK farming business). The group also published a report on genetic modification which suggested that the majority of customers and members did not support GM crops. In 2013 the Co-op dropped its objection to GM chicken and turkey feed and allowed its suppliers to use such feeds, owing to the increasing difficulty in sourcing guaranteed non-GM feeds. Total waste from the business has decreased by 41% since 2006 with 95% of all waste now being either reused or recycled. Product packaging for own brand items has been reduced by 40% since 2006 (by weight). In line with regulations, the Co-op prints information on the recyclability of product packaging on the label. In 2014 over 80% of packaging (by weight - 45% by product line) was widely recyclable. In 2002 the Co-op launched its degradable carrier bags, however these were later withdrawn in favour of recyclable and reusable bags. However, with the increasing prevalence of council refuse collection services across the UK which compost food and garden waste, the Co-op launched a new carrier bag in 2014 which could be used to by the customer to line their food waste bin once they had used the bag to get their shopping home. All profits from the sale of the entire carrier bag range (above the legal charge) are distributed to community projects. The Co-operative distributes food waste to FairShare with the equivalent of 196,000 redistibuted in 2014 and no food waste was sent to landfill. Palm oil is significant as it has one of the highest yields per hectare of any oil, however its production has been linked to significant deforestation and habitat loss, particularly across Africa and South America. In order to reduce this impact The Co-operative became the first major supermarket to commit to only using certified sustainable palm oil in its own brand products. During 2014 the Co-op was awarded 'Best Buy' status by the 'Rainforest Foundation UK' (RFUK) and Ethical Consumer magazine for its use of certified palm oil products and for its palm oil policy. Palm oil for The Co-op is certified by the following standards: UTZ Certified (40%), the use of a segregated supply chain (39%) and with GreenPalm certificates (21%). All of these approaches are supported by the Roundtable on Sustainable Palm Oil of which The Co-operative Group is a member. The Co-operative Group, the largest business in the UK Cooperative movement, is a major affiliate and supporter of the Co-operative Party, which fields candidates in elections on joint tickets with the Labour Party as Labour and Co-operative Party. It is a substantial funder of the Co-operative Party. In addition to core aims of furthering co-operative values and mutualism in Parliament and on the national stage cooperative party members, activists and representatives (MPs, MSPs, AMs and councillors) campaign on wider social issues, including "The Feelings Mutual" campaign. The Co-operative Group facilitates, takes part in or owns services provided for other UK consumer co-operative societies, supports community concerns and projects and runs ethical and social campaigns and advertising and events which correspond to the interests and values of the democratic society and the wider community. Under new rules introduced in 2015, the annual general meeting voted to continue funding the Co-operative Party by a vote of 48,579 for, to 39,479 against. As of 2011, 22 independent consumer co-operatives are corporate members or customer owners, of the group. They invested share capital to found or join the group's wholesaler predecessors, such as the North of England Co-operative Wholesale Industrial and Provident Society and the Scottish Co-operative Wholesale Society. These co-operatives are represented alongside the regional boards at annual meetings and in the board of directors, and are entitled to dividends based on the amount of their purchases from the group. Lincolnshire lincolnshire.coop 1861 228,000 Food (84), Bakery (1), Petrol Stations (10), Pharmacies (48), Post Offices (40), Travel (13), Funeral (17), Coffee Shops (2). In 2002 the society gained Worldaware's 2002 Shell Award for Sustainable Development for its use of Fairtrade goods. and in 2007 it won a Queen's Award for Enterprise in the Sustainable Development category, in recognition of its business practices, including its pioneering stance on Fairtrade and the environment. In January 2010, the society appeared on the shortlist for the Transform Awards for rebranding and brand transformation in a number of categories  A 2011 Which? survey claimed that the Co-operative was the least favourite grocer with 46% satisfaction among customers compared to Waitrose which achieved 85%. The Co-operative Bank has consistently been one of the highest-rated banks in the UK for customer satisfaction. ↑ "Our History". The Co-operative Group. ↑ The present Co-operative Group was founded as a wholesale co-operative in 1863, by a movement which had flourished after the success of the Rochdale Pioneers co-operative, founded in 1844. By 2007, the Rochdale Pioneers, who had been co-founders of the wholesale society, had fully merged with the group, and in 2008, an older co-operative, Lothian, Borders & Angus (1839 or earlier), also merged with the group. ↑ "Site history". Co-operative. Archived from the original on 3 November 2011. Retrieved 28 November 2011. ↑ "About Us". Co-operative Retail Trading Group. 2007. Retrieved 13 May 2008. ↑ Monaghan, Angela (2016-05-21). "Co-op hopes to leave the past behind with revival of its classic 60s look". the Guardian. Retrieved 2016-05-22. ↑ "1862". co-operative.coop. Retrieved 29 November 2015. 1 2 3 4 5 6 7 Myners, Paul (7 May 2014). "Report of the Independent Governance Review" (PDF). Co-operative Group. ↑ "1901 – 1950". co-operative.coop. Retrieved 29 November 2015. ↑ Co-operative News. "Regan's out-of-court settlement with Co-op Group". Co-operative News. Retrieved 29 November 2015. ↑ "Co-op merger approved". BBC. 8 March 2000. Retrieved 20 September 2012. ↑ "Blog: Ten Years from the Co-operative Commission - Co-operatives UK Newsroom". uk.coop. Retrieved 29 November 2015. ↑ Elaine Dean. "My story: How co-operators led a South African boycott in support of Mandela". Co-operative News. Retrieved 29 November 2015. ↑ "The Co-operative - Have Your Say". haveyoursay.coop. Retrieved 29 November 2015. ↑ "Co-op comes to the rescue of Alldays". FoodAndDrinkEurope.com. Retrieved 29 November 2015. ↑ "Co-op opens new NDC". Talking Retail. Retrieved 29 November 2015. ↑ "Co-op boards back merger plan" (Press release). Boards of the Co-operative Group and United Co-operatives. 16 February 2007. Archived from the original on 19 February 2007. Retrieved 17 February 2007. 1 2 "Co-op buys Somerfield for £1.57bn". BBC News. 16 July 2008. ↑ "Co-op Group bids to buy Somerfield chain". Co-operative News. 17 April 2008. The Co-operative Group has confirmed for the first time that is trying to buy the Somerfield chain of food stores in a deal worth at least £1.5 billion. ↑ "Co-operative Group buys 10 c-stores from Sainsbury's". Talking Retail. Nexus Business Media. 28 March 2008. Retrieved 4 August 2008. ↑ "Transfer announcement". Lothian Co-op. Retrieved 21 February 2009. ↑ Members' payout 2008 Archived 12 December 2008 at the Wayback Machine. ↑ "Co-op fined over safety breaches". BBC News. 19 September 2007. ↑ "The Co-op receives near-record fine for fire safety failings | Wire-Free Protection Limited". web.archive.org. Retrieved 26 September 2014. ↑ "The Co-operative - Page could not be found". co-operative.coop. Retrieved 26 September 2014. 1 2 Anne-Sylvaine Chassany and Jennifer Thompson (2 June 2013). "Co-op weighs up banking arm rescue plan". Financial Times. Retrieved 4 June 2013. ↑ Rupert Neate and Jill Treanor (10 May 2013). "Co-operative Bank rushes to reassure customers after downgrade". London: The Guardian. ↑ Rebecca Clancy (5 June 2013). "Crisis-hit Co-op hires ex-Morrisons finance chief Richard Pennycook and banker Richard Pym for restructuring". Daily Telegraph. London. Retrieved 5 June 2013. ↑ Adam Jones (5 June 2013). "Co-op makes fresh changes at the top". Financial Times. Retrieved 5 June 2013. ↑ Anthony Murray (17 April 2014). "Co-operative Group reports 'disastrous' loss of £2.5bn". Co-operative News. Retrieved 4 August 2014. ↑ Paul Gosling (8 May 2014). "Debt has the potential to tear the Co-operative Group apart". Co-operative News. Retrieved 4 August 2014. ↑ James Quinn (9 November 2013). "Co-op Group plans asset sales to reduce 1.3bn debt". Daily Telegraph. London. Retrieved 4 August 2014. ↑ Kamal Ahmed (30 April 2014). "What went wrong at the Co-op Bank?". BBC. Retrieved 4 August 2014. ↑ Joe Miller (17 May 2014). "Co-op Group members approve governance shake-up". BBC. Retrieved 4 August 2014. 1 2 "Co-op sells farms business to Wellcome Trust for £249m". BBC. 4 August 2014. Retrieved 4 August 2014. ↑ Sean Farrell (2 September 2014). "Co-operative Group sells Sunwin security business". The Guardian. Retrieved 12 September 2014. ↑ "Co-operative Group returns to annual profit". BBC News. Retrieved 29 November 2015. ↑ "Rebuild of The Co-operative Group underway". The Co-operative. Retrieved 29 November 2015. ↑ Anthony Murray. "Co-operative Group on track to recovery, while CEO cuts pay packet". thenews.coop. Retrieved 11 April 2016. ↑ Rebecca Smithers. "Co-op commits £125m to slash prices of fruit and veg". the Guardian. Retrieved 11 April 2016. ↑ "Co-operative Food to champion produce from Yorkshire region". Yorkshire Post. Retrieved 11 April 2016. ↑ "Annual Report 2007" (PDF). The Co-operative Group. p. 113 note 31. Retrieved 30 June 2008. ↑ "'Co-operative Legal Services venture launched'". Money News. 21 April 2006. Retrieved 18 February 2007. ↑ "Buy Electrical Appliances Online At The Co-operative Electrical". coopelectricalshop.co.uk. Retrieved 29 November 2015. ↑ "Thomas Cook and Co-op Travel merger faces OFT probe". BBC News. 7 January 2011. ↑ "Our Businesses". The Co-operative Group. ↑ "NOMA - Manchester's New Neighbourhood". noma-manchester.com. Retrieved 29 November 2015. ↑ "Used cars in Lincoln". Retrieved 21 January 2015. ↑ Zoe Higgins (10 April 2015). "Five jobs to go as Co-op confirms closure of Co-op Motors in Empress Road". loughborough. Retrieved 29 November 2015. ↑ "Sale of Lincoln Motor Dealership - Central England Co-operative: food stores, funeral, travel, motoring and optical services in the Midlands and East Anglia". centralengland.coop. Retrieved 29 November 2015. ↑ Atherton, Jayne (11 September 2007). "Business Bites". Metro. p. 41. ↑ "Co-op sells its 774 pharmacies to Bestway for £620m". BBC. 18 July 2014. Retrieved 4 August 2014. ↑ "Top UK co-ops agree merger terms". BBC News. 17 February 2007. ↑ Mutuals Public Register Archived 9 August 2009 at the Wayback Machine. ↑ The Co-operative – a super-brand to watch Archived 19 July 2011 at the Wayback Machine. ↑ "The Co-operative - our democracy". co-operative.coop. Retrieved 29 November 2015. ↑ "The Co-operative Group Board of Directors". co-operative.coop. Retrieved 29 November 2015. ↑ "The Co-operative Group Executive". co-operative.coop. Retrieved 29 November 2015. ↑ "New Co-op storm as board awards bosses huge pay and bonus deals". The Observer/The Guardian. Retrieved 9 March 2014. ↑ Christian Cull (25 October 1997). "National rollout for CWS reward card". The Grocer. Archived from the original on 20 July 2011. Retrieved 3 December 2009. The card which has been on trial since May 1996 is unique in that it awards cash payments rather than credit points. ↑ "Bumper double dividend of pounds 38m for members of Co-operative Group". Birmingham Post. 27 June 2008. p. 21. Retrieved 29 June 2008. ↑ "Press release: Merger delivers strong profit growth, preliminary results". The Co-operative Group. 17 April 2008. Archived from the original on 26 June 2008. Retrieved 30 June 2008. ↑ "Press release: Co-operative Membership smashes three million barrier". The Co-operative Group. 5 August 2008. Archived from the original on 9 October 2008. Retrieved 9 August 2008. ↑ "Co-operative Group sees surge in younger members". Talking Retail. Nexus Business Media. 5 November 2007. Retrieved 30 June 2008. ↑ "The Co-operative". Retrieved 25 July 2015. ↑ "The most ethical supermarkets. Shopping guide from Ethical Consumer". Retrieved 25 July 2015. ↑ "Resources, Policies & Links". co-operative.coop. Retrieved 29 November 2015. ↑ "Winners 2008". European Commission. Retrieved 22 November 2015. ↑ "The Co-operative". fairtrade.org.uk. Retrieved 29 November 2015. ↑ "Our Fairtrade products & stories". co-operative.coop. Retrieved 29 November 2015. ↑ "Fairtrade gets huge boost from The Co-operative's new ethical plan". the Guardian. Retrieved 29 November 2015. ↑ "International communities". co-operative.coop. Retrieved 29 November 2015. ↑ "Fairly traded products - Coffins, charcoal, rubber gloves - Our Ethics - The Co-operative". co-operative.coop. Retrieved 29 November 2015. ↑ Damian Carrington. "Co-op supermarkets extend fridge door scheme". the Guardian. Retrieved 29 November 2015. ↑ "Renewable energy - Energy efficiency - Co-operative Food". co-operativefood.co.uk. Retrieved 29 November 2015. ↑ "Torrs Hydro". torrshydro.org. Retrieved 29 November 2015. ↑ "The Co-operative gives hydro power a double boost". co-operative.coop. Retrieved 29 November 2015. ↑ "Animal Welfare - Farming - Co-operative Food". co-operativefood.co.uk. Retrieved 29 November 2015. ↑ Nicky Amos and Dr Rory Sullivan. "The Business Benchmark on Farm Animal Welfare 2013 Report" (PDF). Archived from the original (PDF) on 8 December 2015. Retrieved 7 August 2015. ↑ "Food: Animal welfare". co-operative.coop. Retrieved 29 November 2015. ↑ "The Co-operative named worldwide seafood champion". co-operative.coop. Retrieved 29 November 2015. ↑ "Responsibly sourced fish - Food and drink - The Co-operative Food". co-operativefood.co.uk. Archived from the original on 8 August 2014. Retrieved 29 November 2015. ↑ "Co-operative commits funding for more sustainable UK fisheries". co-operative.coop. Retrieved 29 November 2015. ↑ "Fish sourcing - Reducing our impacts- - The Co-operative Food". co-operativefood.co.uk. Retrieved 29 November 2015. ↑ "Campaigning". co-operative.coop. Retrieved 29 November 2015. ↑ "Climate change". co-operative.coop. Retrieved 29 November 2015. ↑ "H2Oil". dogwoof.com. Retrieved 29 November 2015. ↑ "Leading businesses to disclose greenhouse gas emissions". www.gov.uk. Retrieved 29 November 2015. ↑ "Fighting Spirit". earthisland.org. Retrieved 29 November 2015. ↑ Juliette Jowit. "Indigenous people to launch legal challenge against oil firms over Canada tar sand project". the Guardian. Retrieved 29 November 2015. ↑ "BBC News Channel - Our World, Tar Wars". BBC. Retrieved 29 November 2015. ↑ "Testimonials". RAVEN. Retrieved 29 November 2015. ↑ "Life above the Alberta tar sands – why we're taking the government to court". the Guardian. Retrieved 29 November 2015. ↑ Terry Macalister. "Shell faces shareholder revolt over Canadian tar sands project". the Guardian. Retrieved 29 November 2015. ↑ "US Shale Gas Drives Up Coal Exports - Tyndall Manchester Research". tyndall.ac.uk. Retrieved 29 November 2015. ↑ Rayner, Gordon (5 August 2013). "Shale gas: Co-op is major corporate backer of anti-fracking movement". The Daily Telegraph. London. ↑ "Community Energy Challenge". cse.org.uk. Retrieved 29 November 2015. ↑ "Co-operative Food research champions traffic lights and front-of-pack labelling". Retail Times. Retrieved 29 November 2015. ↑ "green dots explained - traffic light labelling for a healthier diet". co-operative.coop. Retrieved 29 November 2015. ↑ Co-operative News. "Co-ops back labelling crackdown". Co-operative News. Retrieved 29 November 2015. ↑ "2001 – present day". co-operative.coop. Retrieved 29 November 2015. ↑ "Co-op to extend braille labelling to food range". marketingmagazine.co.uk. Retrieved 29 November 2015. ↑ Copping, Jasper (21 March 2009). "Wine ingredients including fish and charcoal should be listed on the bottle, say regulators". The Daily Telegraph. London. ↑ McVeigh, Tracy; Sherwood, Harriet (29 April 2012). "Co-op boycotts exports from Israel's West Bank settlements". The Guardian. London. ↑ "Chemicals". co-operative.coop. Retrieved 29 November 2015. ↑ "Foe congratulates co-op on pesticides action". Friends of the Earth. Retrieved 29 November 2015. ↑ "Precautionary principle pushes out the pesticides.". forumforthefuture.org. Retrieved 29 November 2015. ↑ "Co-op bans 20 pesticides from food". BBC News. 2 July 2001. ↑ "Removing pesticides from the food chain". pan-uk.org. Retrieved 29 November 2015. ↑ ruth. "2011 Supermarket Comparison - PAN UK". Pesticide Action Network UK. Retrieved 29 November 2015. ↑ "Pesticide & chemical restrictions - Residue policy - Co-operative Food". co-operativefood.co.uk. Retrieved 29 November 2015. ↑ Alison Benjamin. "Co-op bans eight pesticides after worldwide beehive collapse". the Guardian. Retrieved 29 November 2015. ↑ ruth. "Coop and PAN UK call for review of neonicotinoid risk assessment - PAN UK". Pesticide Action Network UK. Retrieved 29 November 2015. ↑ ruth. "PAN UK applauds the Co-op support for European Commission proposed neonicotinoid suspension - PAN UK". Pesticide Action Network UK. Retrieved 29 November 2015. ↑ "what we're doing". co-operative.coop. Archived from the original on 24 March 2010. Retrieved 29 November 2015. ↑ "Sainsbury's, M&S and the Co-op follow Tesco's lead on GM feed". TheGrocer.co.uk. Retrieved 29 November 2015. ↑ "Waste and packaging". co-operative.coop. Retrieved 29 November 2015. ↑ "The Co-operative is first to offer compostable carriers in hundreds of stores". The Co-operative. Retrieved 29 November 2015. ↑ "Co-op Group unveils £22m Avonmouth distribution centre". TheGrocer.co.uk. Retrieved 29 November 2015. ↑ "Commercialmotor.com - The Co-op 'streamlines' its deliveries with G&A's wind-cheating Dolphin duo--Biglorryblog has the news!". commercialmotor.com. Retrieved 29 November 2015. ↑ "How did the retailers perform?". WWF. Retrieved 29 December 2015. ↑ "The Co-operative Food commended for palm oil use - Food News UK". The Co-operative Food news. Retrieved 29 November 2015. ↑ "Palm Oil - Rainforest Foundation UK". Rainforest Foundation UK. Retrieved 29 November 2015. ↑ "Sustainable sourcing - Forest sustainability - Co-operative Food". co-operativefood.co.uk. Retrieved 29 November 2015. ↑ "Co-op Group to continue funding political parties". BBC. 16 May 2015. Retrieved 17 May 2015. ↑ "Annual Report and Financial Statements" (PDF). Chelmsford Star Co-operative Society. 27 January 2007: 5. Archived from the original (PDF) on 27 March 2009. Retrieved 11 January 2008. ↑ "Grosmont". Co-op Online Directory. Co-operatives UK. Archived from the original on 7 April 2009. Retrieved 12 August 2008. ↑ "Grosmont Co-operative Society Limited". uk.coop. Synergy arm of Co-operatives UK. Archived from the original on 29 September 2011. Retrieved 23 August 2008. ↑ "Grosmont Co-operative Society Limited, number 992R". Mutuals Public Register. FSA. Archived from the original on 7 April 2009. Retrieved 12 August 2008. ↑ "Annual Report and Financial Statements" (PDF). Heart of England Co-operative Society. 20 January 2007: 8. Archived from the original (PDF) on 27 March 2009. Retrieved 11 January 2008. ↑ "Hawkshead & District Co-op Society Limited". Retrieved 19 November 2013. ↑ "Hawkshead and District Co-operative Society Limited, number 2242R". Mutuals Public Register. FSA. Archived from the original on 7 April 2009. Retrieved 12 August 2008. ↑ "Langdale and Neighbourhood Industrial Co-operative Society Limited". uk.coop. Synergy arm of Co-operatives UK. Archived from the original on 29 September 2011. Retrieved 23 August 2008. ↑ "Langdale & Neighbourhood Industrial Co-op Society". Shop directory. Village Retail Services Association. Retrieved 23 August 2008. ↑ Archived October 5, 2006, at the Wayback Machine. ↑ "History: 1864". Lincolnshire Co-operative. Retrieved 4 August 2008. ↑ Annual Report & Accounts 2014/15 (PDF) (Report). The Midcounties Cooperative. 2015. Retrieved 15 February 2016. ↑ "Stores". Radstock Co-op. Retrieved 20 February 2014. ↑ "2002 Shell Worldaware Business Award". Worldaware. Retrieved 18 February 2007. ↑ "Winners 2007". Queen's Awards for Enterprise. Retrieved 13 May 2008. ↑ "Shortlist announced for the Transform Awards for rebranding". Communicate magazine. January 2010. ↑ "Which Survey 2011". Which. February 2011. Wikimedia Commons has media related to The Co-operative Group.